Amid uncertainty about the future of the Affordable Care Act, Cook County officials urged residents to purchase health care plans in the Illinois marketplace before the Jan. 15 open enrollment deadline. Cook County Board President Toni Preckwinkle joined with Rep. Danny Davis, D-Ill., Regional Director of the U.S. Department of Health and Human Services Kathleen Falk, and others to highlight the success of the Illinois marketplace in the face of Republican pressure to repeal President Barack Obama’s signature health care law. President-elect Donald Trump called on Congressional Republicans Tuesday to repeal the law, also known as Obamacare, before negotiating a replacement in an interview with the New York Times. Such a move would impact the more than 276,000 people in the Chicago area who have enrolled in marketplace plans since November, Preckwinkle said. “Now we live in a time of naysayers, but make no mistake: contrary to much of the sound and fury we hear out of Washington, the Affordable Care Act has been a monumental success,” Preckwinkle said. 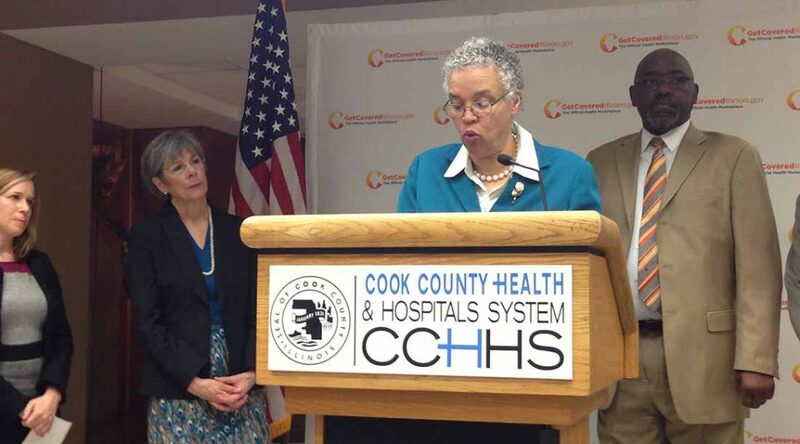 Before the law, more than half of Cook County hospital patients were uninsured; now about two-thirds have insurance, Preckwinkle said. Access to healthcare under Obamacare has reduced the number of individuals relying on emergency rooms for their primary care. Preventative care helps individuals lead healthy, longer lives with dignity, said Jay Shannon, CEO of the Cook County Health and Hospitals System. Obamacare came under fire this fall when the Obama administration announced that premiums for mid-level plans purchased through state exchanges would rise an average of 25 percent nationally. House Speaker Paul Ryan, R-Wis., recently described it as a “failed law,” saying that high premiums and deductibles have left many unhappy with their coverage, in a statement on Jan. 5. Six out of 10 consumers purchasing healthcare on the Illinois marketplace have a premium of $100 or less a month after tax credits, Falk said. Congressional Republicans remain divided on legislative alternatives, but many have spoken in support of expanding Health Savings Accounts. Though these savings plans may help some individuals, those who have most benefited from Obamacare may not have money to save for future health expenses, Rep. Danny Davis said. Open enrollment for healthcare plans purchased through the Illinois marketplace ends on Jan. 15th for those who want coverage starting Feb. 1. Plans can be purchased on the marketplace until Jan. 31st, though coverage may begin after Feb. 1.